It is one of the great poems from the school curriculum of everywhere English is taught, the host of golden daffodils that Wordsworth that William Wordsworth described when he wandered lonely as a cloud near his Lake Grasmere home. The Lake District has traded on the fame for two centuries. Wordsworth was the Lake District equivalent of what the Lord of the Rings was to New Zealand. It was only on a visit there that I realised that Wordsworth was a thief. Wordsworth, or at least William Wordsworth did not see the daffodils at all. His sister Dorothy did, and told him about them. The two had an extraordinary relationship, separated as children they vowed never to part again and settled together in the gloriously named Dove cottage in Grasmere in 1799. The poet later married, and all three lived in the district for the rest of their lives. The cottage and adjacent Wordsworth Museum have been open to the public for a long time now but every time you stop by you can find another surprise. The knowledgeable curator will talk you through his Irish connections and sympathies. On a wall is mounted the passport he used in 1790 and 1791 when he went on long walking tours through revolutionary France. 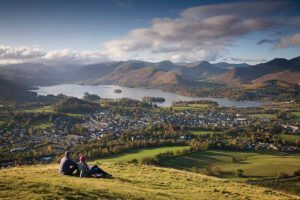 A couple sitting on the fell at Latrigg overlooking Keswick in the Lake District by Derwentwater lake in the distance. The graves of the Wordsworth family in the local churchyard sit solid into a landscape which the poet clearly did not invent single-handedly, but might well have. 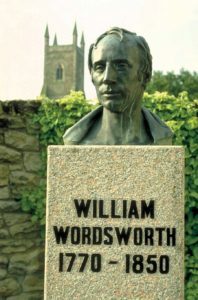 Wordsworth effectively launched the English Romantic movement in 1798 with his famous (and anonymous) Lyrical Ballads, the short lyrical and dramatic poems written with Samuel Taylor Coleridge which made him famous. More importantly it landed the English Lake District in the landscape of the imagination of the wider world. There was no desire to visit rugged scenery at the time. Tourists went to spa baths, the seaside or on pilgrimages. But Wordsworth’s verse awoke tourist interest in his native Lake District. It is impossible not to leave Dove Cottage without feeling inspired. Home at Grasmere, joyously celebrated Wordsworth’s taking possession (in December 1799 is one of the best introductions to the writer and the eight years he spent at Dove Cottage were the most productive of his life. In 1808 Wordsworth and his family moved from Dove Cottage to larger quarters in Grasmere, and five years later they settled at Rydal Mount, near Ambleside, where Wordsworth spent the remainder of his life. The narrow, lake-filled valley nearby contains Windermere, England’s largest freshwater lake and one of the most famous in the world. It lies in two basins separated by a group of islands and the collection of ancient steamers that ply their trade on the waters testify to its status as one of the country’s oldest tourist resorts. Kendal is the main gateway to the region. The town’s motto is “Pannus mihi panis,” commonly translated as “Wool is my bread.” The cloth known as Kendal Green was allegedly what Robin Hood wore, it was a favourite of foresters, but it is no longer made. The place doesn’t entirely look as bleak and indeed as inspiring as it does in Wordsworth’s time the area west of Windermere has been replanted in coniferous forests. A host of golden pines doesn’t have the same ring to it.